"Autumn is a second spring, when every leaf's a flower." Nature in transition. My favorite times of year are not the long expanses of hot/cold in the summer and winter, but the seasons in between. For each brief transition, the world is full of changes. This period takes its course, a new equilibrium is met, and we go into a long expanse of sameness. I wanted to revisit several spots I had painted in the summer, but had mixed feelings about. A different season can put a totally new spin on things. I'm not entirely sure how I feel about this piece. This year's fall came early and was unusually short. Fall felt like it ended before it got started. I feel this may be reflected in my pictures. I think the topic of sketching isn't discussed often enough. I devoted a day last week to doing sketches, so this post is in its honor. I've yet to meet someone who didn't sketch, even people without artistic "talent." What do most sketches have in common? They're very quick, often informal, and the focus is not so much on results. As an artist, the danger is not doing enough of them. I certainly fall into this trap sometimes. One can get too caught up in churning out paintings. The artist's technique becomes tight: they lose playfulness and spontaneity. 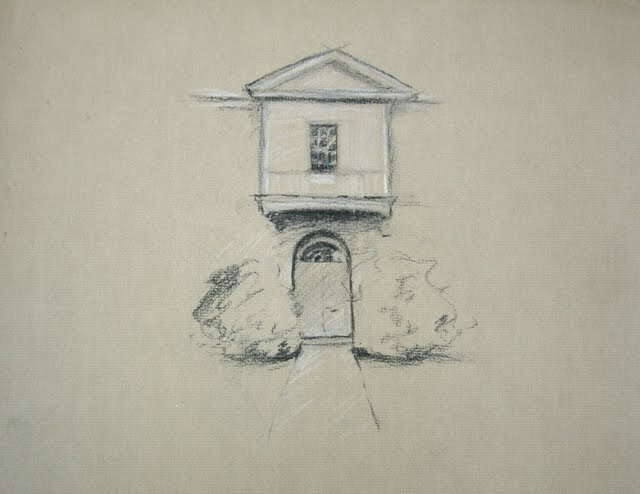 Sketching is just the quickest and purist drawing one can make. Every artist, no matter how skilled or experienced, also needs to brush up on drawing from time to time. Many artists are reluctant to share their sketches with others. They can be intensely personal. A lot of times they are embarrassed or worried about being judged. 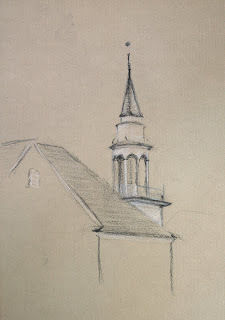 I'm going to share with you two quick sketches I did of a church downtown. These were done with charcoal and white pencil. I limited myself to only a short period of time to make a complete statement. I'm not sure what I will do with these. Maybe I will use one to make a painting. Maybe it will simply be a record I can revisit later on. Or maybe it will do nothing but sit in the sketchbook. This is part of the fun of sketching. 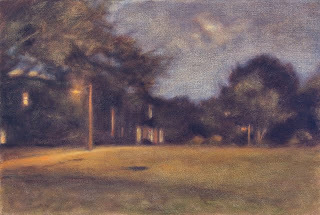 Oil on Canvas 24" x 16"
Last week there was another full moon, and as always, I went out to try my hand at another nocturne. In the past, my nocturnes have been highly improvised. I would wait until the moon was well developed and shone brightly in the sky. Then I would jump into the car and search the area until I found a particularly brilliant spot to capture. This time, I had a plan in my head before I started. Recently, I've been moving towards more formal compositions in my work. Laying out the perspective with a ruler in the dark was an interesting experience. I thought a marina woud be a perfect place to highlight the moon. 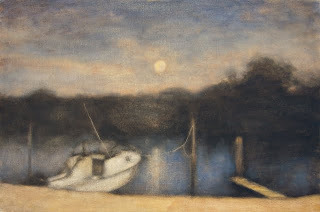 I've spent a little time around boats and marinas, and I always found them very relaxing places to be. The cool breeze and gentle calm of the water is very peaceful. I tried to capture that feeling in this piece. 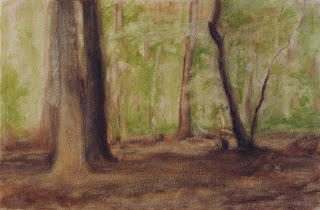 Here's a small update on the status of my forest painting, which I was able to work on a few more days. This picture is taking on a more literal, technical feel than I perhaps envisioned at first. There is always a tug of war going on behind the scenes, between the urge to bombard the viewer with detail, and to hold back and perhaps be more subtle. A highly-detailed technically polished piece can be very impressive and highlight an artist abilities. It can also reduce a pictures ability to express and communicate a specific emotion or idea. I try to make my pictures mysterious, and quite often that is more about what I choose to highlight and leave out of my pictures. This picture has been a combination of different techniques. In some places I've wiped down lighter areas, in others begun to apply thicker paint. I've oiled out the darkest areas in the shadow of the foreground, and will mostly leave those alone now. 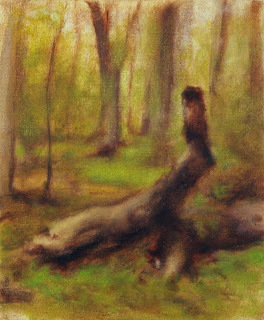 The finishing touches on this piece will be to push the contrast higher, especially the trees in the background that are obscured by shadow. Linseed oil is made from the seeds of the flax plant. It is the strongest of the drying oils suitable for oil painting. Oil is extracted from the seeds under extremely high heat and pressure. The oil is then refined using strong alkali chemicals. The process is cheap, has high yields, and is done on a massive scale by a few large producers. Most commercial artist's paints are made from this oil. The traditional process of making oil was far different. 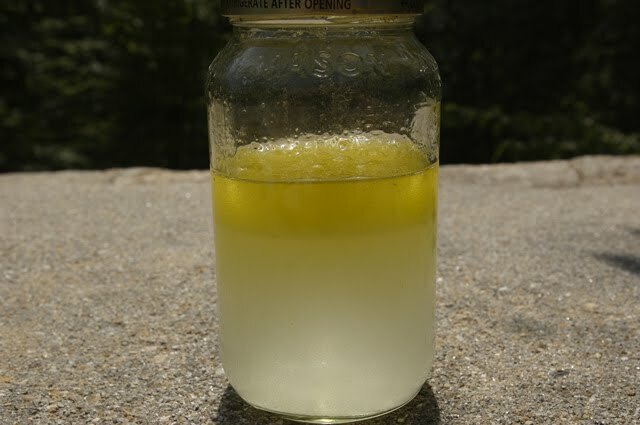 It was cold pressed and purified without harsh chemicals, usually just water. The process was slow and had lower yields, so it was long ago abandoned by industry. 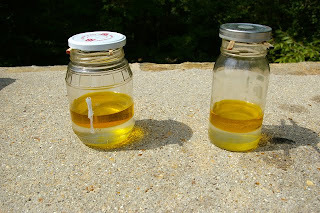 I began making my own linseed oil the older way several years ago. It is not difficult, only time-consuming. I buy only organic cold-pressed flaxseed oil. an edible health supplement. The oil should be unrefined, and not have any additives. Before the oil can be used, it should be filtered of impurities. I pour the oil into glass jars about an inch high. Distilled water is added to the oil and the contents are shaken so that they are thoroughly mixed. The closed jars are placed to sit under the sun for several days. Our roof has a nice flat shelf to one side, so I put my oil up there. The oil and water will eventually separate. 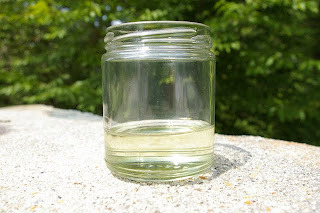 Impurities such as mucilage become trapped in the boundary layer between the water and oil. I carefully remove the oil off of the top. I filtered this batch about three times over. Properly cleansed, the oil is placed out in the sun again. 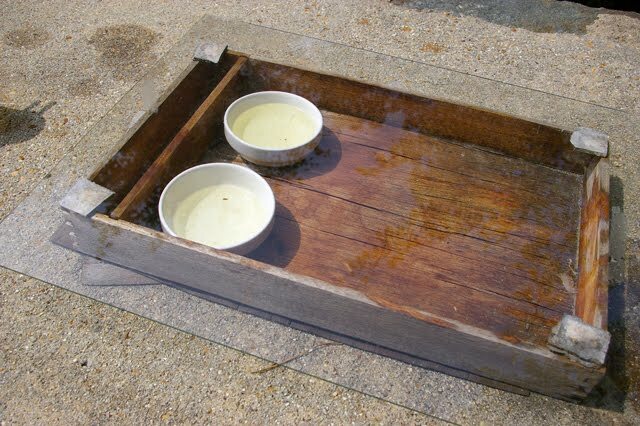 I pour the oil into small bowls, place them in an old box, and cover it with glass. I've put little spacers between the glass and box so that air can circulate inside easily. The finished product is crystal clear, and has been bleached by the sun to a pale, straw-color. I'm still amazed at how simple and effective this process is. 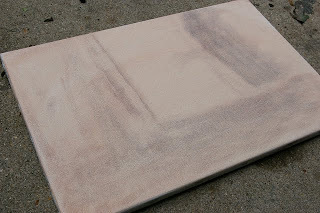 Used in a painting medium, the oil will dry in a few days, versus weeks for the typical store bought variety. Here is the second attempt, a few days into the start. 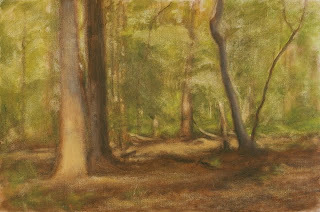 When its finished, this painting will highlight the stream of light through the forest at that magical hour. I have to admit, this piece has been challenging. The magical hour really only lasts an hour, so I have to work quickly, rely on instinct and memory. I've had to revise and move around several elements to improve the composition. Here's some background on my technique. I usually start the picture with an outline, done in thin washes of earth color. I mark down where I want the trees to go, and the ground level. Then I go in and quickly fill the rest of the picture. At this stage its just a mass of light green for the tree cover in the background. It's better to fill the canvas completely early on, even if its wrong, than wait until later. Everything is interactive. 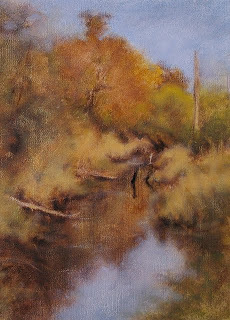 It's far easier to see mistakes when comparing a full canvas to nature. rather than a blank one. The picture will grow and develop organically over the days and weeks it is worked on. It will gradually be layered with thicker and thicker paint. Areas that I've deliberately kept soft will be selectively sharpened. The trick is doing this in a way that keeps everything cohesive, yet still interesting. This picture began as a nocturne–I went out under the full moon with completely different plans, and ended up in front of some law offices downtown. Some otherwise nondescript buildings are transformed as they recede into the night. There's an air of mystery surrounding them: only the remaining lights tell us there is a building there at all. I've found this effect very flattering in all of the cities I've been to. On a sunny day I would have passed these buildings by. As an experimental picture, I'm encouraged by the results. I played around with the placement of the lights to make it most effective, and learned a lot about glazing to get the color of the lights against the dark. I'm definitely going to revisit this type of picture in the future. Oil on Canvas 10" x 12"
It's often difficult to explain how I choose my subjects. Sometimes, all of the work has been done for me and all I have to do is capture it with some feeling. Other times only a particular object, a clump of trees, a building, a sky on a particular day will stand out, the rest I have to improvise. I was riding my bike through the woods and this particular spot leapt out at me. 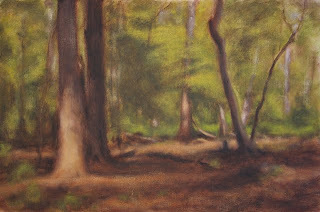 This oil study is to prepare for a much larger forest painting. 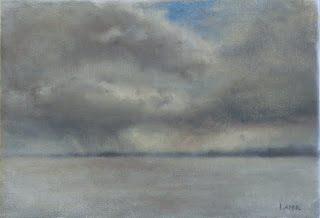 Oil on Canvas 14" x 10"
This picture is one of my first storm paintings. Ever since I was a kid, I've been fascinated by the weather. I still love to watch thunderstorms build, from a safe distance of course! Painting them from life in real time is a considerable challenge. This summer storm was fast approaching from the south, I was able to catch it from the other side of the James River. About an hour later, all hell broke loose.